Review of employee information fields. Validation tables to ensure proper data entry. Access restriction to keys by employee. Multi-level input sequences definable per key. The HandPunch 4000 is more than just a time-and-attendance tracking device. It's a comprehensive access control system that enhances your security, while ensuring accurate records and saving money. The HandPunch works by identifying a user's hand geometry - the unique size and shape of their hand. This means your employees will no longer need to carry cards or keys. The costs and risk associated with credentials that can be lost, stolen or duplicated without authorization is also eliminated. HandPunch also eliminates time fraud by making it virtually impossible to "buddy punch." The result is less cost of ownership and more accuracy, productivity and profitability for your company. Accurate verification in any conditions - since HandPunch identifies users by hand geometry instead of a fingerprint, identification will still be accurate even if the user's hand is wet, injured or dirty. Programmable for your needs - ten user-definable data management options let you collect and/or display data as employees punch in, such as department transfers, tips collected, job codes or pay codes. The HandPunch may also be used to allow employees to review punches, job schedules, vacation time accumulated, hours worked and more. Manage schedules by employee - individual employee schedules may be downloaded to the HandPunch 4000 to restrict the times that an employee can punch, reducing unauthorized overtime. 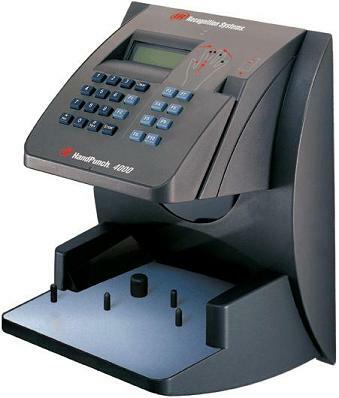 Built-in bar code reader - when a badge is required for identification, the HandPunch 4000 is available with an integrated bar code reader. The swipe-style reader supports the most poplar bar code formats and allows for infrared badges. Edit-at-the-clock capability - supervisors can override user restrictions to input data such as missed punches, planned vacations and sick time right at the terminal. A built-in audit trail documents each of these functions to ensure the highest level of security. Antimicrobial protection - every HandPunch has a built-in antimicrobial coating on the surface of the platen. This finish helps inhibit the growth of bacteria, mold and fungi and lasts for the life of the device. Hand outline - every HandPunch comes standard with a blue hand outline printed on the platen. This ensures accurate hand placement for verification, as well as quick, easy enrollment. Memory Retension: Up to 5 year via the standard internal lithium battery.